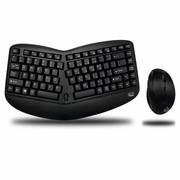 The Adesso 2.4GHz Wireless Ergonomic Mini Keyboard & Mouse offer users two advanced input devices with ergonomic design, multi-functional features and a wireless range of up to 30 feet. The design of this keyboard with splitted key zones and gently sloped encourages natural position of hands, wrists, and forearm in maximum comfort for long use. 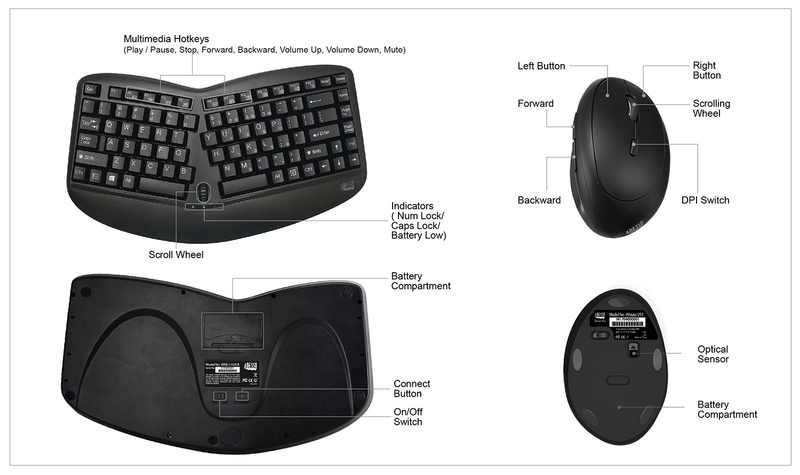 Users can save space with the mini sizing design while enjoy the ergonomic shapes of the keyboard and mouse. The included wireless mouse not just provides comfort but also equips with a DPI switch for changing resolution (800/1200/1600) and two Internet navigation buttons. This keyboard and mouse combo works at any angle, wire-free, with a range of up to 30 ft. The split key zones and gently sloped shape design of this keyboard encourage the natural positionings and comfort of your hands, wrists, and forearms during long use periods. The Built-In Scroll Wheel makes scrolling within documents a breeze. Users can achieve higher work efficiencies by eliminating the need to switch between their keyboards and mice. Designed to keep your hands in the natural resting position, this not only relieves joint pain and improves posture, but has also been shown to relieve back pain and spinal discomfort. The vertical design provides bettersupport for your forearm, minimizing wrist pain that can come from twisting. Our vertical ergonomic model helps you achieve a more natural grip, better support, and natural wrist position. The mouse’s enhanced optical engine of selectable DPI (800/1200/1600) allows your device to work with improved speed, accuracy, and reliability. With the On/Off Switch and built-in Auto-Sleep features, you can automatically maximize your battery life when your keyboard is not in use.